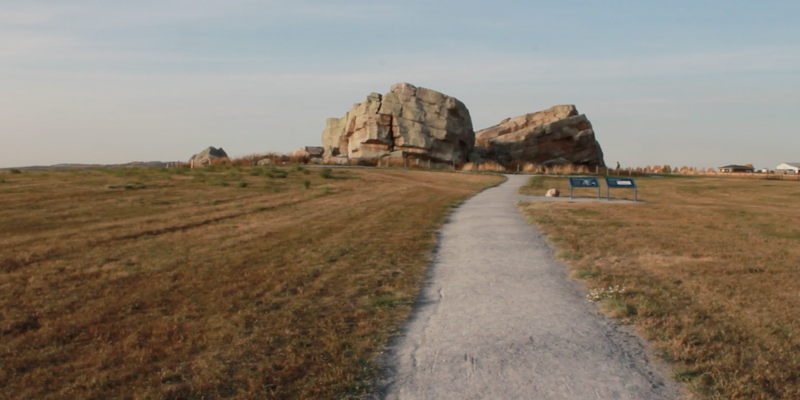 ‘The pond’ is how Ryan and his wife Adrienne referred to the Helen Schuler Nature Reserve sitting between Lethbridge and the edge of the Blood Reserve. A deep valley cut through by the Oldman River (Napi) with ponds and wetland vegetation is surrounded by trees now turning yellow with the approach of the cold weather. The area is home to a variety of birds and other animals such as turtles, rabbits, bats and beavers, whose large family lodges have a central location in the pond amongst the nesting birds as if they were the guardians of the valley. Ryan and Adrienne have been coming to this place for many years, coming to know its many plants and animals intimately even as individuals. Their immersion in this place is of such quality that the place and its animals have also come to know them, at moments showing them where to collect foods and medicines. 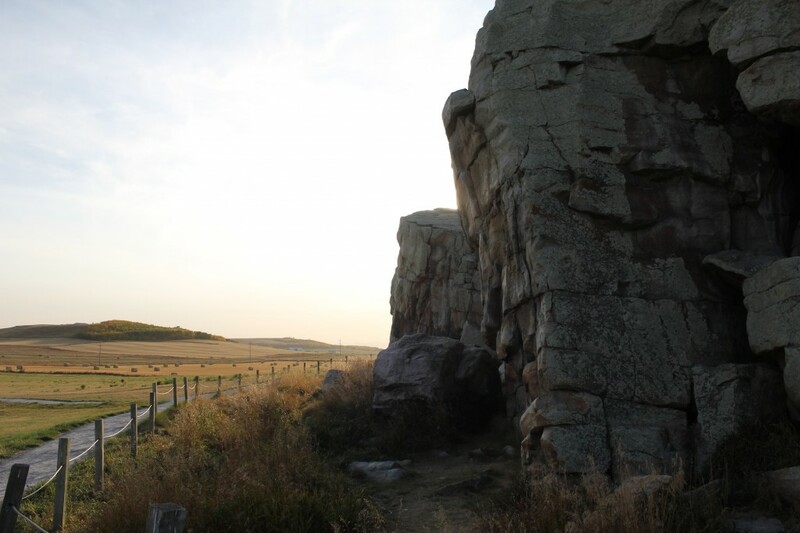 Ryan and Adrienne showed us around this place and explained to us how they came to learn from it and how this relates to Blackfoot ways of learning and to the stories concerning the relationships of humans to place and other beings. Central to our encounters and conversations with the people associated with Red Crow College have been questions related to epistemology, that is, the philosophical enquiry into the nature of knowledge and knowing, of what is considered ‘knowledge’, how we acquire it, and in cases of meeting of different traditions of enquiry, such as that between the Blackfoot and ‘globalised’ science how and why does one prevail over the other. 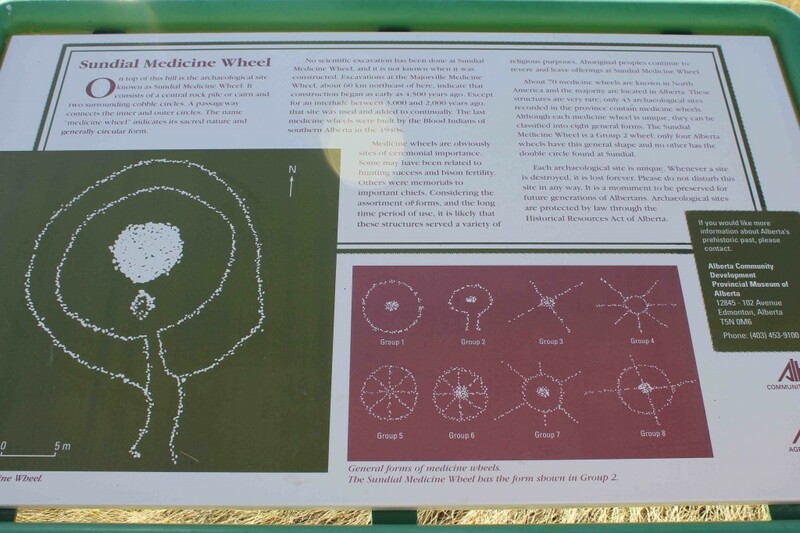 At the heart of Blackfoot ‘ecological-spiritual’ knowledge and practice are the various medicine bundles which are the material objects that embody these and serve as focal points in the ceremonies and exchanges related to each bundle. In Blackfoot the term used is amopístaani which Ryan translates as ‘bound-together-by-wrapping-around’ (see Heavy Head 2005). The significance of this binding together, as we will see, describes not only the physical bundling of various material components but also the binding of beings through contractual relationships. One of the most important bundle for the Blackfoot is the Beaver Bundle. It took us sometime to understand and fully appreciate the meaning and significance of the Beaver Bundle. Although we have only begun to do so, even this brief exposure to this way of learning, knowing, relating and communicating has left a deep impression on us. In conversations with Ryan and Adrienne, as well as with Narcisse, the cultural translation of the Beaver Bundle would amount to something like the material and ceremonial embodiment of the contractual relationships that humans have with other plants, animals and beings. These contractual relationships, which relate back to the stories of how humans first received the Bundle from the Beaver people, involve both a knowledge of the behaviour and environment of a variety of beings and the reciprocal conduct humans ought to have with these so as to ensure a balanced co-habiting in this place. Furthermore, animals also have their own bundles between themselves and other animals, so ensuring a reciprocal dwelling and existence in which no species dominates or exterminates another. Here I was reminded of the anthropological theory of ‘perspectivism’ developed in relation to Amazonian peoples which states that in ‘western’ ways of thinking (epistemology) it is considered that we share a common ‘nature’ (biological and genetic) with other animals but that what makes us distinct as humans is our capacity for culture. Amongst a number of indigenous communities however, this is inverted: we share with other animals the capacity for culture but inhabit different kinds of bodies or have different natures which allow us to do different things. So animals, such as the jaguar in South America, or here the beaver, have their own societies, language, kinship relations. Adrienne reinforced this point as we walked around the pond, showing me a colony of ants who were carefully farming aphids perched on the stalk of an absinthe (wormwood) plant. The ants milked the sweet nectar the aphids produced, perhaps a mildly psychoactive, whilst protecting them from the hungry ladybugs that crawled close by. An Ant Bundle, were such a thing to exist, would then have within it this set of knowledges and relationships that are part of the ant’s perspective on the world. This is what the Beaver People, who had been inhabiting this place for millions of years, passed to the Blackfoot in the story of the Bundle. Physically the Beaver Bundle consists of the coats of the various animals who are part of these contractual relationships and other objects all of which have associated songs and dances that pertain to some aspect of the natural environment or of the behaviour of animals. The Bundle acts as a library of ecological knowledge which is interpreted and recited or sung and danced by the holders of the Beaver Bundle. This duty befell Ryan and Adrienne, though as they stated this was unusual concerning their young age as this role has historically been taken by elders. Ryan compared the traditional role of elders in Blackfoot society to that of amateur naturalist groups, often frequented by the elderly, who, at this stage in life, have more time and patience to observe the natural world. The bundle also acts as a ‘peer reviewed journal’ legitimating and communicating newly acquired observations about the natural world, such as changing weather patterns or the introduction of new species. These then come to be codified in new objects and songs and dances and added to the Bundle’s ceremonies. Altogether the Bundle has hundreds of songs, with no single individual knowing all of them. The story Ryan and Adrienne told us of how they were inducted into the Beaver Bundle suggests the qualities underpinning this way of knowing and hints at what might be called a Blackfoot pedagogy, of which Narcisse and Cynthia have also written and taught elsewhere (see Blackfoot Pedagogy course). As part of their initiation into the Bundle Ryan and Adrienne were required to put on a feast that required them to serve traditional foods such as, amongst other things, fowl eggs. These had to be acquired rather than purchased and it took several seasons of trial and error for Ryan and Adrienne to learn how and where to source these as no one around had this knowledge. The elder’s instructions, himself a holder of the Bundle, led them to immerse themselves into this experiential learning which came to form the basis of how Ryan taught the Kainai Studies course at Red Crow College. Before ceremonies, such as that of the Beaver Bundle, were banned and prior to the knowledge inculcated through residential schools, a working knowledge of place, the seasons, the plants and medicines, the animals would have been widespread amongst the Blackfoot. This would have been a day to day practical knowledge learned from elders, grandparents, from peers. With these government policies, enshrined in the Indian Act of 1885, residential schools, the confinement of the Blackfoot to the reserves, the destruction of their traditional environment through settler agriculture and the decimation of the buffalo few today have the thorough knowledge of place and beings embodied in the Beaver Bundle. Indeed the knowledge of the Bundle almost disappeared altogether in the 1990s according to Ryan as one of the few remaining Bundle holders returned his Bundle to the River assuming no one else was interested in learning it. Today the learning of the Bundle, its knowledge and values of inter-being and reciprocity have been rejuvenated and institutionalised through the courses Ryan teaches at Red Crow ensuring that the next generations can once again benefit from a learning of place and its beings that has kept a people alive in this part of the world for thousands of years. For me, the inspiring learning from this practice of the Beaver Bundle has been how knowing is intrinsically bound to entering into relationships with; with place, people, non-human beings. Also, the authoritative sources of learning are much broader than in traditional academic epistemology (primarily other scholars and through books) to include dreams, landscape, plants, animals and other beings. This epistemological expansion shifts the human intellect from the centre of the universe placing it instead as one one amongst many other intelligences from whom we can learn. Ethically this means that the world is not only there to gratify human needs and desires, as is the tendency in the Judeo-Christian tradition, but rather it is a network or bundle of relationships we learn to enter into. Udi and I visited the ‘Head-Smashed-In-Buffalo-Jump’ UNESCO World Heritage site and museum the second day of our arrival to southern Alberta. 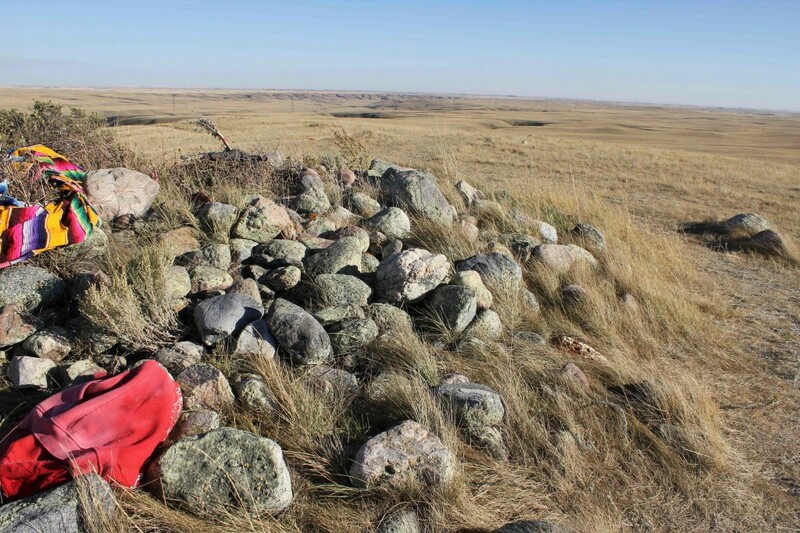 We want to better understand the different histories and stories of this vast region, through visits to different sites in the area that represent Blackfoot voices (we write about this more in another posting on visits to sacred sites). The Head-Smashed-In museum was a wonderful initial engagement into the area, particularly as it immersed us into the importance of the buffalo to all aspects of history of the Blackfoot region – the people, the diversity of the landscape (other animals and plants). Land is undoubtedly the most important issue related to First Nations, indigenous and Aboriginal communities. To explain the depth and holism of land’s significance is profoundly difficult — this is primarily because the importance of land is much more spiritual than it is intellectual – and because it includes all that is connected to the land, the plants, the animals, the sky, and what is beneath the land – in all phases of time (past, present and future), events of which are told through nuanced stories and song. A deep reciprocal relationship that was and still is a part of a Blackfoot way of viewing and interacting with the world puts humans very much as a part of (rather than superior to) everything else in the world. For me to ‘know’ the importance of land goes beyond understanding this significance purely with my head, I have to feel it, sense it in a connected way that transcends articulated explanation. This is perhaps the biggest learning that Udi and I will encounter again and again over this year of travel and visiting to initiatives in different parts of the world. Although reading and comprehending is of course important, knowing and learning (via reading) only engages with a fraction, a partial perspective of the whole. 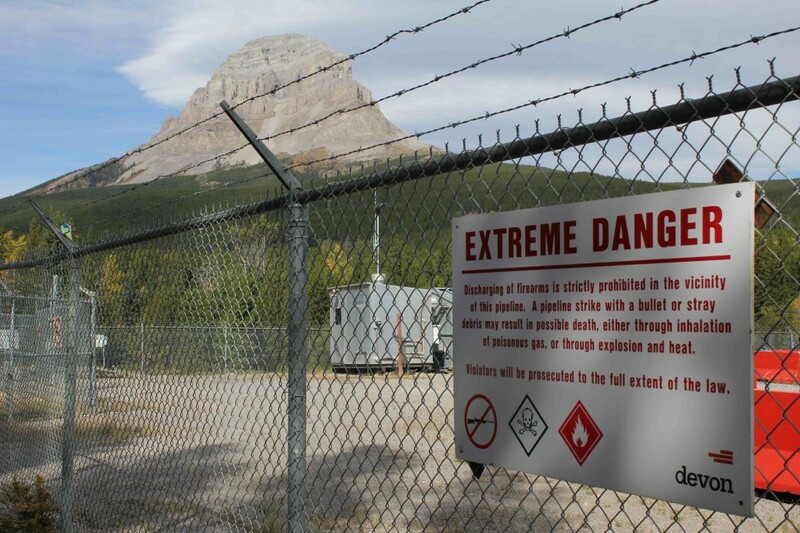 Prior to visiting Alberta, I had read extensively about this region of the world. I could articulate the importance of the land and place in a limited and rhetorical way, but these explanations were detached – replete with a lack of connectedness. The importance of land, of place, is difficult to explain in words, especially in our noun-based English language. 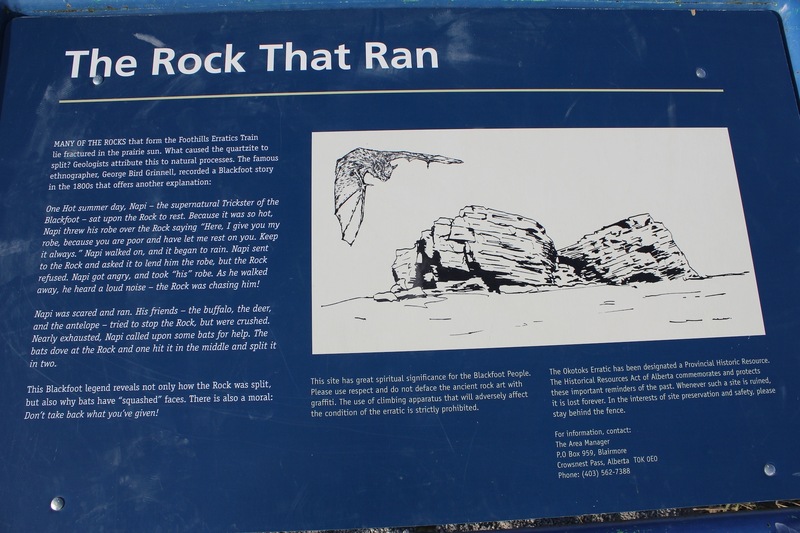 In the Blackfoot language (in contrast) as so much of the vocabulary arose through and with the landscape, words and phrases are much more action or verb-based, which brings with it a closer and more intimate connection to land and place. These linguistic distinctions relate to how we as European descendants tend to engage with and ultimately view nature (the non-human), in a detached way, where we are somehow separate, rather than being inseparably linked. Even the popular phrase, ‘save the Earth’ somehow places us outside of and above the Earth – that we can save it, that the Earth needs us for its salvation. This type of discourse does not recognize that the Earth will go on, with or without us!I remember learning many years ago in an environmental philosophy class I took at New York University, diverse worldviews that encompass different ways of viewing and experiencing ‘the environment’. We tend to be taught in school and outside of school (mainstream media for example and also religious texts – the Book of Genesis in the Bible) that humans are somehow superior to the rest of the Earth – that our role as human beings is to be stewards, to manage, the animals and plants of the Earth. Although this is of course important to some degree, it is also possible to see how this manifests an unbalanced power relationship – how we as humans then propel ourselves too far above the rest of the Earth, with unabashed authority that has all sorts of destructive consequences, such as, in this particular case, the decimation of the buffalo by the European settlers to North America. The photo below is a recorded ‘Winter count’ – a chosen event, or story, of a particular year that held immense importance for the Blackfoot. Winter count was a way through which Elders recorded important feelings and experiences over time. Important events and stories were recorded on buffalo hides and many have been recovered from between 1764 – 1927. These stories are important to better understand the experiences of Blackfoot during this period of terrible upheaval to their lives. Of particular and profound significance is the decimation of the buffalo. 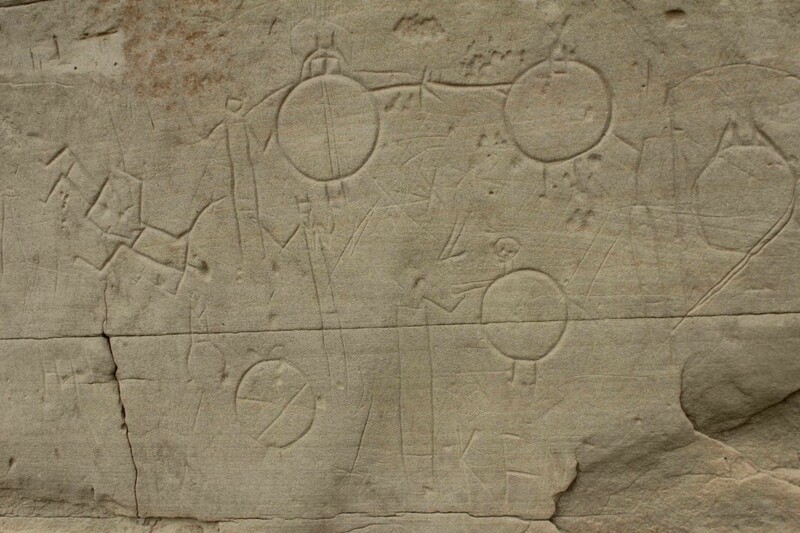 The story portrayed through this Winter Count photo represents the most significant event that occurred to the Blackfoot people in 1879 – and it is the story around this portrayal that this posting tries to capture. The Blackfoot had lived with the buffalo for thousands of years, and the buffalo were fully integrated into all aspects of the lives of the Blackfoot peoples. There was and continues to be a profound reverence for the buffalo. Blackfoot, in solidarity with other First Nations and Aboriginal peoples, engage with all animals and plants in and on the land through a deep spiritual relationship of reciprocity. Buffalo were provided for through prayer and reverence, a deep knowledge of their behaviors and lives and by using a very limited number in a very thorough way. For sustenance, all parts of a buffalo were used as food, shelter, clothing and medicines. From the point of the first European contact in 1806 it took less than 70 years to completely decimate the buffalo population that thrived on the entire range of Blackfoot territory (and far beyond). 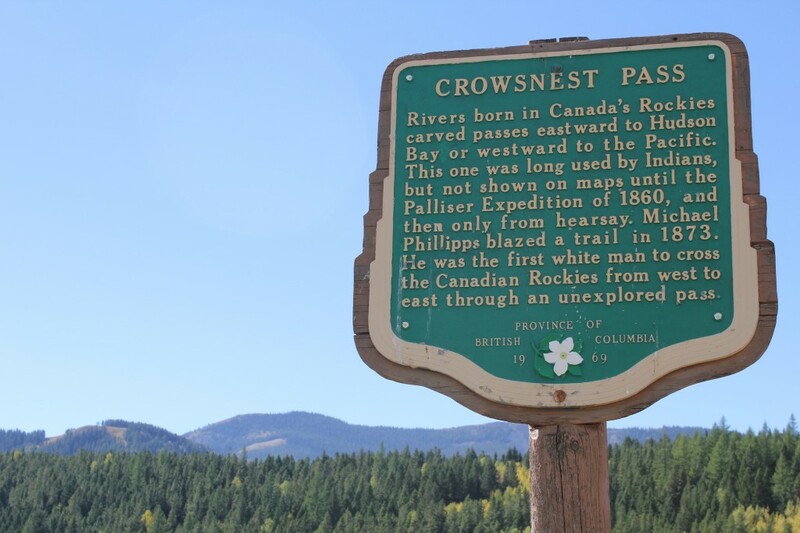 There was interaction with the Hudson Bay Company through trading from the 1750s but European contact came after – the first recorded interaction was with the Lewis and Clark expedition in 1806. By 1860, the Blackfoot began to rely more and more heavily on Canadian and US go vernment food supplies because of the shortage of buffaloes to hunt. The tremendous and rapid decrease in buffalo numbers also brought about more tension between the Blackfoot and other First Nations communities, especially the Cree. 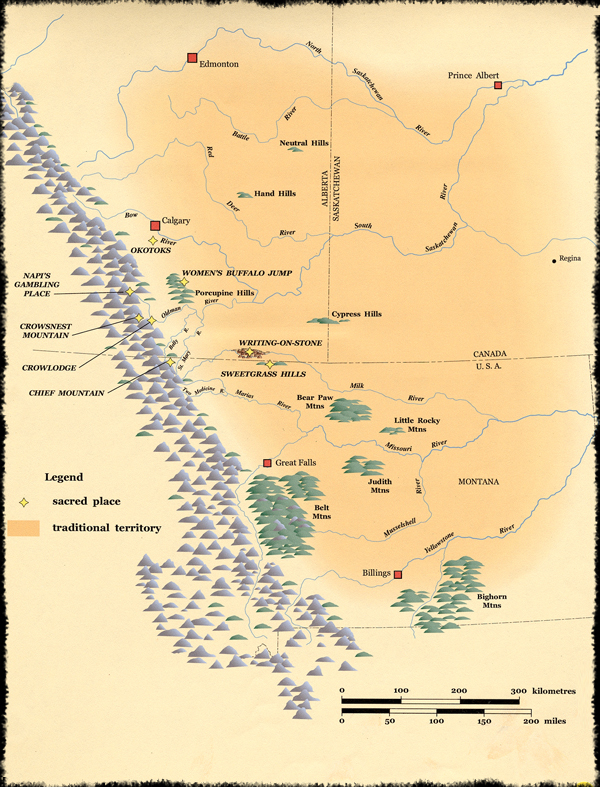 Although the Blackfoot and the Cree were historical enemies, prior to European contact warring was enacted through raids and/or tended to be fought between two individuals (each representing a different group) rather than with the intent on killing as many people as possible from one side to the other. The scarcity of buffalo meant an increase in competition between all First Nations groups as the few buffalo that were remaining in the middle of the 1800s could be found in Blackfoot territory. By 1881, European traders and sportsmen were responsible for bringing the population of buffalo down to less than a 1,000 from an original number varying between 40 to 70 million. It is one of the greatest atrocities of any life in human history. The picture here is a testament to the selfishness, arrogance and total lack of care – not just for the buffalo, but for the land in general. Buffalo were killed for sport (especially shooting as many as possible from the newly established railroad systems), for trading (especially their furs as their hides were more pliable and stronger than cow hides) locally and internationally – and parts of the buffalo were used in factories (elastic bands) burgeoning in various parts of North America. The indiscriminate killing of the buffalo (in terms of how it was experienced and felt spiritually by the Blackfoot) could be comparable, perhaps to the annihilation of churches, of crosses, and even of religious leaders within European culture. Buffalo were not worshipped in a polytheistic way by the Blackfoot (this has been historically completely misunderstood by Christian missionaries). Rather, buffaloes and many other animals and plants, were revered, greatly respected and admired. In addition, Blackfoot knowledge encompassed a deep engagement with buffalo, an intimate knowledge of their fertility and seasonal migration patterns and their various behaviors. The ways in which the Blackfoot hunted buffalo was learned and taught through ceremonial transfer exchanges that embraced and practiced this intimate knowledge. Before horses were introduced in the late 1700s, groups of buffalo were very cleverly hunted — the Blackfoot led groups of buffalo over ‘buffalo jumps’. 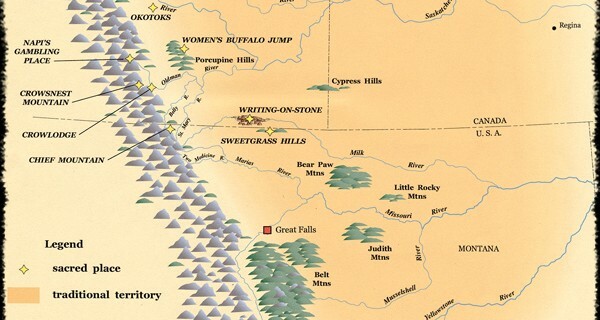 In a complex formation of mimicking wolves, mother-infant buffalo relationships and buffalo group dynamics, the Blackfoot would work together to encourage a group of buffalo to stampede over the cliffs of the buffalo jump. This ‘working together’ entailed young men dressing up (using furs and pelts) and acting as wolves and as young buffalo to get the attention of the wider herd. Other Blackfoot would form a wide pathway leading to the cliff (with people also dressed in furs and spaced widely apart, intermittently, but close enough so that the buffalo stayed within a bounded area toward the cliffs). 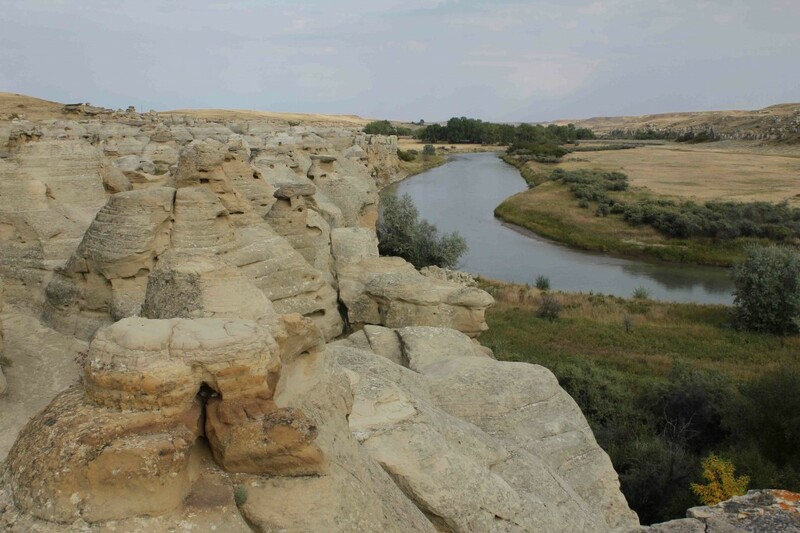 The landscape of the plains is such that any cliffs, coulees or canyons are often very difficult to see until you are up close – from afar, these breaks in elevation look as part of the ever-rolling prairie plains. 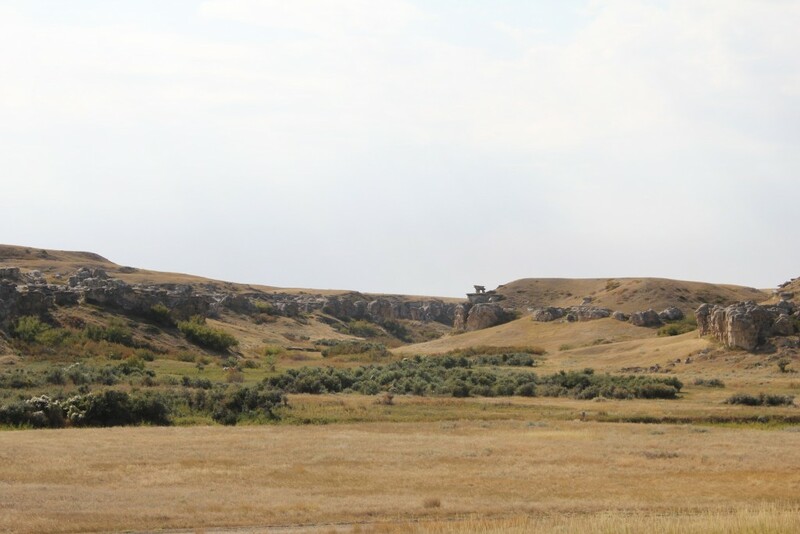 The particular site of Head-Smashed-In Buffalo Jump Museum has been archaeologically excavated and there is evidence of that particular area being used as a buffalo jump almost consistently (with the exception of a 1000 year gap between 3,000 – 4,000 years ago) for the past 10,000 years. The name of the museum comes from a story where a young brave went to witness the plunge of buffalo over the cliffs. Standing behind a ledge he watched the buffalo fall past him – but he became trapped between the animals and the cliffs because of the high number of buffaloes falling to their deaths. When his people found him, they found his skull smashed in by the weight of the buffalo. The name for the place in Blackfoot is estipah-skikikini-kots (where we got our heads smashed). Buffalo continue to excite the imagination for people from all over the world. 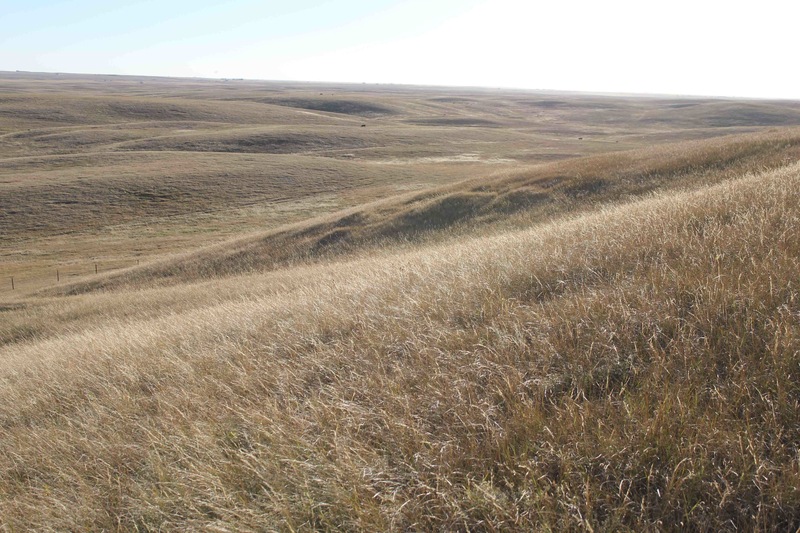 However, the range of buffalo living today is limited to reservations on public and privately owned land. This photograph was taken at Yellowstone National Park where buffalo are a popular sight. Our first sighting of a buffalo was in the middle of Yellowstone, a lone buffalo grazing quite calmly in spite of the hordes of tourists lining the road taking photographs with all sizes of lenses. In addition to Yellowstone, there is an extensive range of wild buffalo living in northeastern Alberta – Wood Buffalo National Park (the largest National Park in Canada) although the longevity of their livelihood is likely to be severely compromised by toxins emanating from the ever-expanding Tar Sands region. The Tar Sands watershed area is a part of Wood Buffalo National Park. The Tar Sands region is a 5-hour drive north of Edmonton and is one of the most crucial environmental issues of our time – for a wonderful in-depth account of Tar Sands, watch the documentary film, “The Tipping Point: The Age of the Oil Sands”. Narcisse Blood spoke to us several times of the significance of the buffalo to the well-being of the land in the Blackfoot region. He spoke to us about the deleterious effects of industrialized farming that is prominent across the majority of the landscape – and how a re-introduction of buffalo would rejuvenate the health and spirit of the land, not ever to its original wealth of biodiversity (often compared to the Serengeti Plains of Africa), but at least to a level of long-term sustainability. The story of demise and survivance of the buffalo as well as the Blackfoot are in accordance with eachother. The photograph below of a mural depicting a buffalo was taken from Fort MacLeod, the small town 30km north of the Blood Reservation, where Udi and I stayed for a marvelous 3 weeks. The buffalo depicted here is commodified as it has been painted on the side of a tourist shop, which, inside has many material objects with images of buffalo for sale.